April, 2012. It is time I updated this page. For my original post introducing the system, see below. When I wrote the original post I had not taken the ponies barefoot. They are now barefoot as described here. I have a small track system in a wet climate. I think the idea of a track system makes so much sense for me that I could not see myself keeping horses without it unless I had a lot of land. I have the luxury of two stables but they are (almost) always kept open. Ben likes to use one at times; Rosie, never. The terrain here, hilly, rocky and with the advantage of a group of pine trees, provides for natural variation in footing. 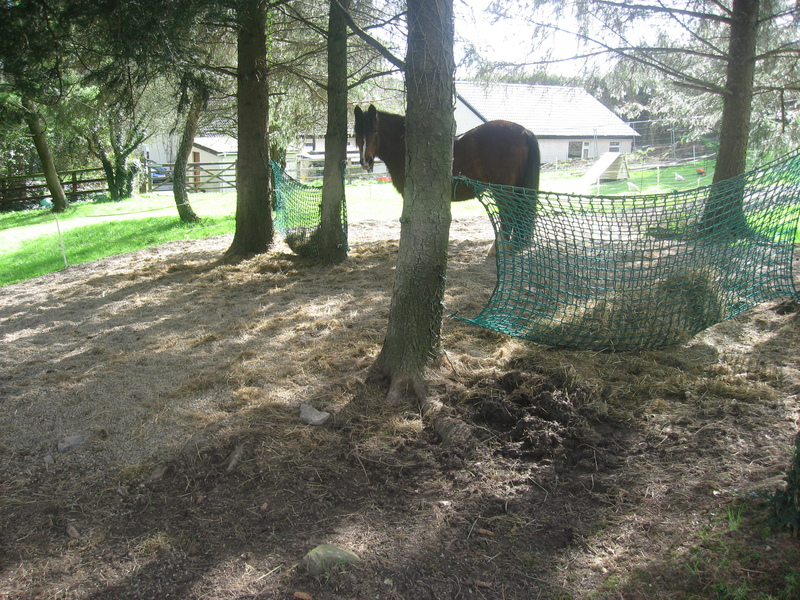 Since I started the system I have added large haynets permanently strung between the pine trees. The shelter of the trees has limited the wastage of hay that was occurring when I had haynets tied at different places around the track. And I do not think it reduced movement to a great degree. The hedgerow from spring on provides for grazing and the ponies usually like to rest on the higher ground at the back of the paddock. But with those large haynets came large amounts of mud to add to the mud that the front section of the track produced. So, when we had a digger here doing work on the property, we added stones and then pea-gravel to the area under the trees. We also spread pea-gravel on top of the crusher dust that was in my picadero. she stops to graze the newly leafing hedgerow. The rest of the photos were taken a couple of weeks earlier when we had a sunny, dry period. At the top of the track is the picadero, which I often leave open, and is the reclaimed land of my St Bridget’s Cloak experience. All the land up this hill has worn very well. There is a covering of crusher dust which has impacted onto the rock (lots of rock!) that was underneath. When we first dug the track, a digger smoothed the rock into a workable slope for us. 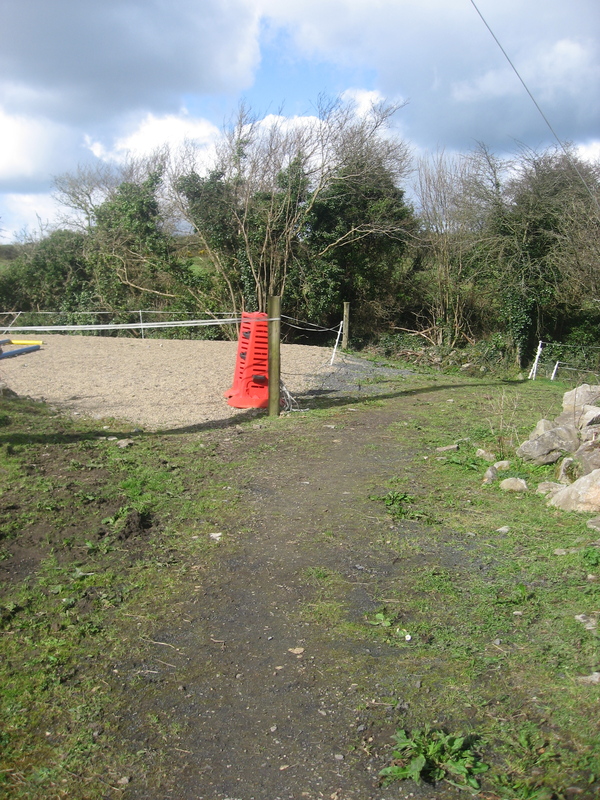 Here is the picadero with its pea-gravel surface, I use it mainly for in-hand work and also sometimes for free lunging. Both Ben and Rosie have no problem trotting and cantering on this surface. 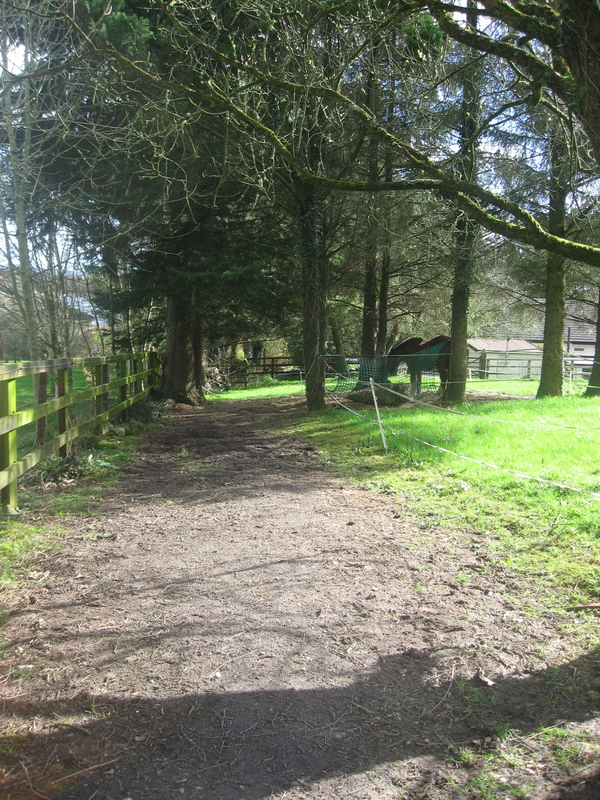 Then the track turns the corner and crosses past the back gate. Ben and Rosie often rest here, in the shelter of the hedge. Underneath the trees is the new pea-gravel surface. It is spread widely and already has a good hollow created by Ben and Rosie rolling. The track returns to the stable yard. This has been scraped back by the digger and more stones added in an attempt to combat the mud. The back of our paddock rises on limestone but the front section has less and the water runs down to it. About a year ago I read Joe Camp’s Soul of a Horse. What stood out for me in that book was his description of his paddock paradise; a light bulb moment in fact. Because, before this I kept a horse at home during the summer but never thought I could do so all year round. I also used to wish that our acre here behind our house were bigger (still do of course) and more lush. It rises on limestone rock and there is hawthorn, hazel, an oak tree and various others which we want to keep. From further reading I did, I realised that our sparser grass, wild herbs and hedgerow are all an advantage, as are the hill, the rock, the clumps of trees, the roots, everything we have back here in fact. So we have created a track which moves from the stableyard area, up a hill, to a wide area where I put haynets and where they like to roll, across the back, down the gentler slope on the other side to a clump of trees where there are more haynets and where they often rest, across a very muddy part of the track and back to the yard. So water is by the stable, the stable door is left open at all times, and hay is in two corners diametrically opposite each other. The track has been scraped down mostly and crusher dust put on places, but the front section has become too muddy and will need to be scraped back. 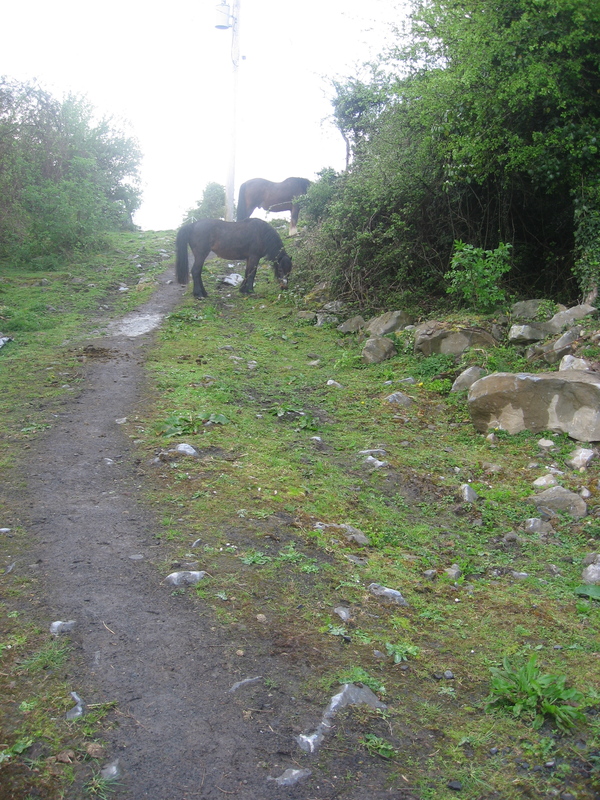 They are not the liveliest pair of ponies but they do use the track and it definitely encourages movement. 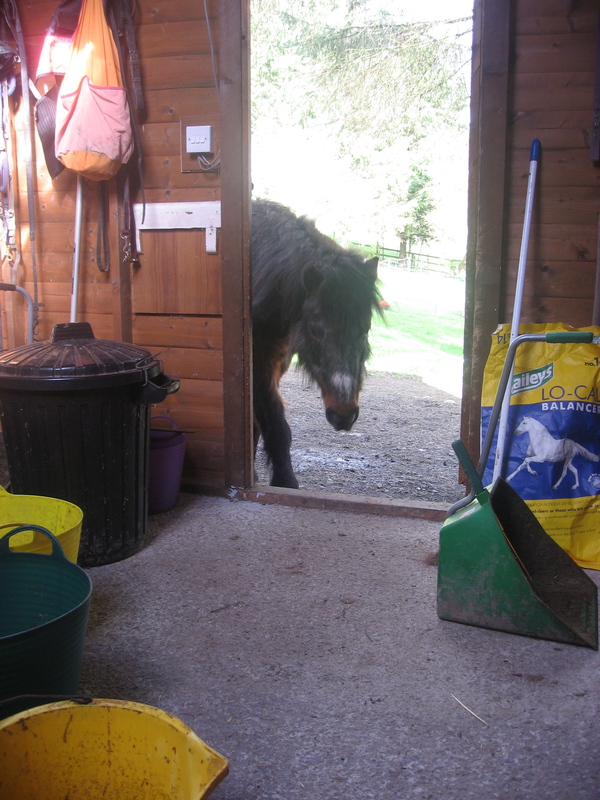 During heavy winter rain I make a yard around the stable and close them into that at night, with the stable door open and an area under trees where they can lie down. Now, most people who have track systems seem to have barefoot horses. Little Rosie is barefoot as she is laminitic, but Ben has shoes. While I am interested in the idea of barefoot, there is no local expertise here and it feels too complicated for me right now. Ben is also perfectly happy and sound in his shoes. I am keen to have a track system as I want to keep my ponies out and moving and also save my land and it is certainly meeting that purpose. 25th September 2010: Updated to add: you can see new photos I have put on the main page of my blog here, in preparation for removing Ben’s shoes and transitioning him to barefoot. I would love to create a track system some day. From people I’ve talked to, they work great and the horses seem to enjoy them. Welcome to my first commenter! The track system has worked really well. We have had floods in November, followed by 5 weeks of a heavy frost and some snow and are back to normal weather of storms, rain, some sunshine and the track has stood up to all of that. Even when it froze, there was only one day when I shut my ponies into the yard around the stable, otherwise they were out in contrast to all my other horse friends around here who had to have 24 hour stabled horses. This gave me the comfort of knowing that, although I could not ride, I did not have a horse going crazy in his stable and getting no exercise and that Rosie did not get stiff as she was out and moving. I too have considered the track system – I do it a little bit by putting their hay in long ‘tracks’ in whichever field they are in and they spend their days grazing and walking most of the time. They are happier moving and eating in little bits rather than huge piles, I think. Love your photos – it looks perfect for your ponies! I think encouraging them to move is the key. In so many places in wintertime turnout means a small area of hard standing or an arena. And of course when I can’t manage to ride I console myself with the thought that a level of fitness is being naturally kept up. Hi there. I came across your blog from the PP wetpaint website. I am very encouraged by your PP as I think I can create something similar at my own place. I never dreamt I could bring my 14h haflinger gelding to live at home as I thought it was too hilly,too many rocks and not dead flat like all the other paddocks I see horses in. I love your set up. How long would you say your track is? and do your ponies go into the paddocks to graze? The largest open space I have at home would be about 30 meters by 40…I am a little reluctant to make this area my lane way as it’s the biggest area I have…I thought of connecting it with a track that can go around the back perimeter of my property…and this would be about a 120 meter track going up the hill and back down. Thanks so much for sharing your PP its nice to see some smaller set ups as I couldn’t afford a bigger acreage in my lifetime! Hi Vrinda. Welcome! My track is probably about 160m in total. 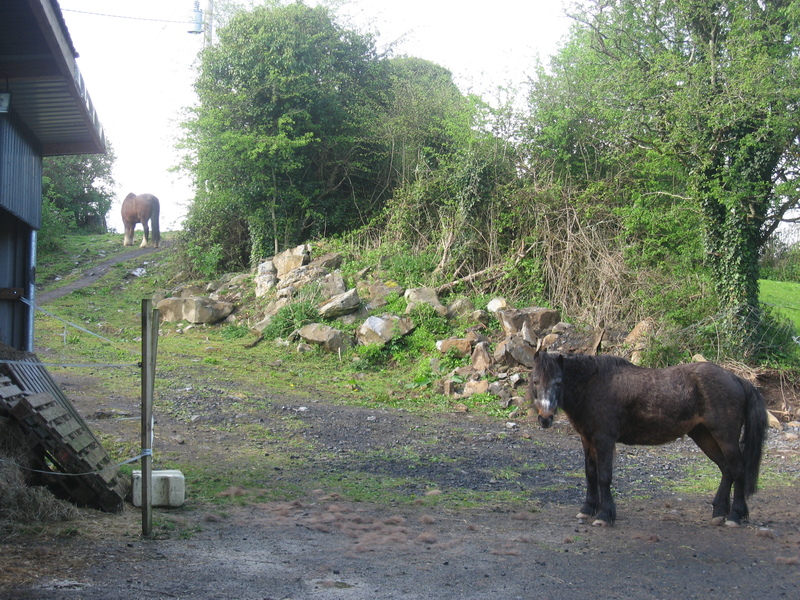 My ponies graze the paddocks, and my garden and some extra space we have at a lake across the road. I am keeping one section of paddock for them to graze this winter. There will not be much but I like that they can get a taste of grass as a change from the hay. I am very careful about giving them too much grass however. Particularly as Rosie is laminitic. Your size sounds fine for your halflinger. Hills are good, rocks are good, they will keep him moving and much fitter than if he were standing in a flat paddock. No one does track systems here – nor do they seem to understand the concept – but I get many comments as to how well my ponies look. He would need some flatter areas in which to roll. This could be in your grass, but my two are off the grass for most of the winter and do roll in the wider sections of the track. It is so exciting when you realise that you can keep your pony at home. If mine were in livery, they would be stabled at night and turned out into a small paddock by day, so they are doing much better here. Good luck with it. Feel free to ask any questions you think I could help you with. I have had my track system running for over a year now and I am still tweaking it. I imagine it will be a constant work in progress. Thank you so much for posting this ( found this at the PP wetpaint site), I have an acre and have half of it set up for paddock paradise. I’m planning on adding the next section soon. But just wanted to say thanks for showing that it can be done on small acreage! Hi Akyra. You are very welcome. Good luck with adding on your next section. I am a big fan (obviously) as it works so well. At the moment, I am leaving hay at night by the stable yard only, yet Ben and Rosie obviously make good use of all the track. In fact the only hardship is in mucking out the track but even that is probably much quicker than cleaning well used stables. I put a link to here from the PP wetpaint site as I got loads of information from that site when I was planning mine and thought the least I could do was share my experience also. What a lovely paddock paradise you have there! I have taken the liberty to add a link to this page to my Dutch paddock paradise website as a PP example abroad, hope you don’t mind? The link is on this page. I thought your name sounded familiar, but I see you’re a student of Carolyn Resnick as well (so am I), so I probably saw your name on her blog. Your name is familiar to me too, from Carolyn Resnick’s website. Thank you for putting a link to my page on your site. I have just been over and managed to find your photo album, yours looks really good (as do your ponies). I live in Co Clare – we must be the rainiest county in Ireland! What helps my track is that we are situated on limestone. However, currently even the muddy places are rock hard due to the recent dry weather. I would definitely recommend it as a system, particularly if you have lamis who are confined to a very small space. I know people who have much more land than I have and yet their ponies are confined to postage stamps of paddocks for fear of laminitis. So their natural need to move is frustrated. You can be inventive with the track, having narrower and wider places, allowing rocks remain (if you have any) or throwing down some logs to encourage lifting of legs (and back) as they move around. In Jaime Jackson’s paddock paradise book he recommends burying salt licks and having a wet area. I have never figured out how to bury salt licks (they hang in the stables) and the track can be quite wet enough without providing a wet area. Spreading hay around the track also doesn’t work here because of our weather, but due to the hedgerow on two sides of the track, foraging behaviour happens regularly. Where are you living? If you are anywhere near here you are very welcome to come and see the track system in action. your set up sounds brilliant and the ponies must have such an interesting life! 🙂 I have recently moved my horse home and have 4 paddocks of about 1 acre each, on varied terrain. The problem is the paddocks are not adjoining, so it would be hard to set up a paddock paradise I think….they do seem to move around a lot though, more so than when he was fed from a round bale at the livery yard. This is definitely the way I want to go longer term though! Oh, I am just THRILLED to have discovered your blog. I recently moved to a property in Waterford, with 3 and half acres of grazing, wet and boggy most of the time and a horror in winter. 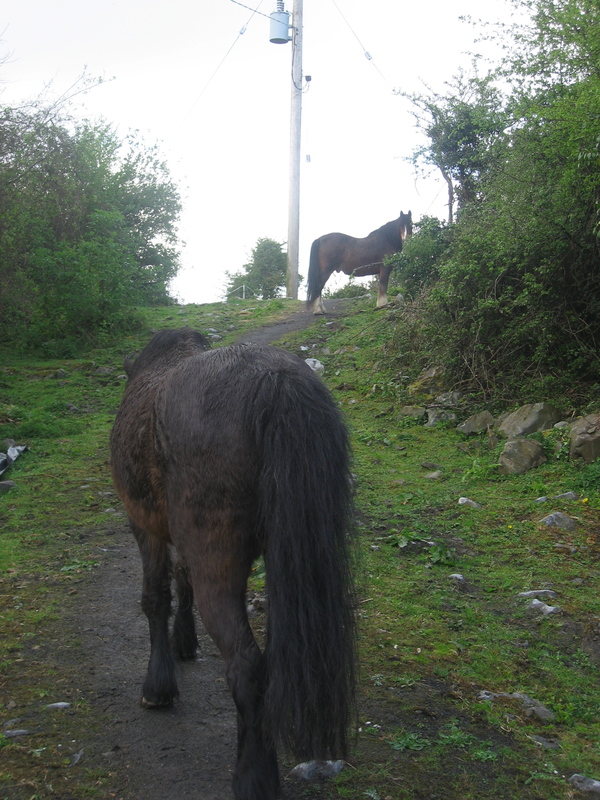 I have adopted 2 rescue Shetlands and scratching my head as how best to manage the grazing, avoid laminitis and not have to stable them or restrict their grazing with tiny paddocks or grazing muzzles…………….I’m off right now to plan my track!! Also…….did you have to show them to walk the track in the beginning or did they do it on their own? Do they tend to always walk in one direction and do they walk all the way around or turn around and come back the way they went? Hi Carole, welcome and good luck with your track. It works really well but does require a bit of planning. For two small ponies I would suggest that some sections are quite narrow to keep them moving, with corner areas being wider so the less dominant pony won’t get trapped and with rolling and chilling spaces as well. Mine never needed to be shown the way. They tend to go in one direction – possibly because the hill is very steep on one side and they seem to prefer to come down the hill rather than go up. Sometimes they turn around and sometimes they complete the circuit. You will need to watch the mud – you may need to put stones down. 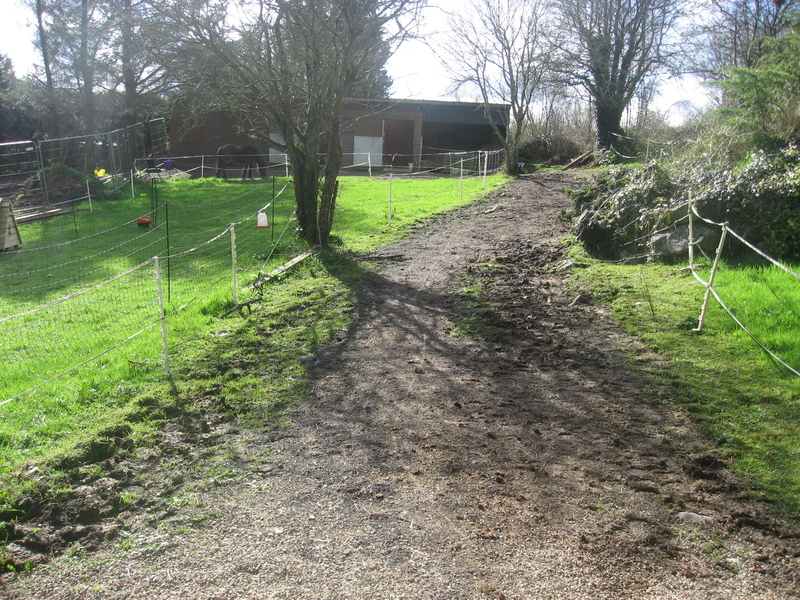 Some of my track, the lower section where the water drains to, became very difficult to manage, very sticky and this winter we did some radical work with a digger. We happened to have the digger here doing something else, otherwise it would have been quite expensive. If you have hedgerow use that and I would suggest not being afraid to use rocky and stony areas as well. I need to update this page as my distribution of hay has changed in response to Cloud’s arrival. I am sure you will find that your track will be a constant work in progress – but a fascinating one I find. I was so excited by your blog that I went straight out and purchased more plastic stakes and tape and built a track immediately within their existing 1 acre paddock. When I went out 3 hours later they were already walking around it……anti clockwise….:-). By now they are about halfway. This is fabulous to see. 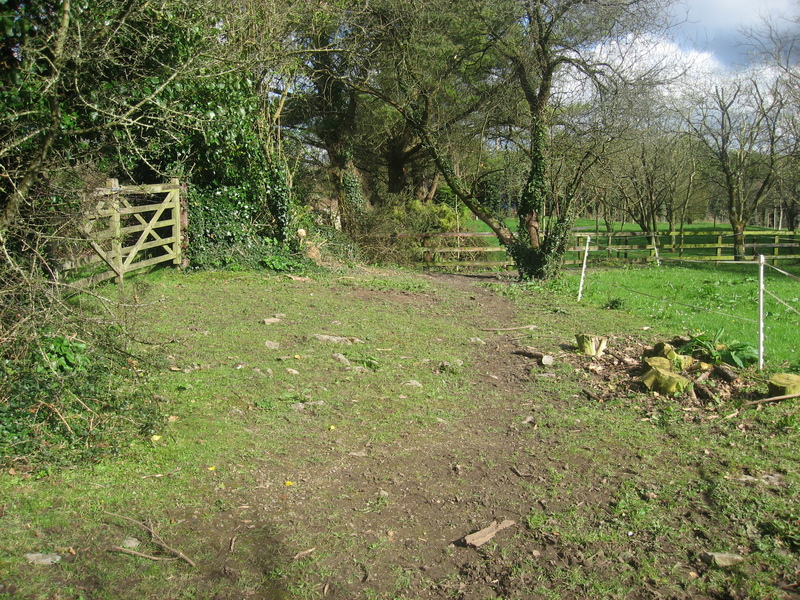 There is another 3 acres available and I am currently putting Permaculture principles into practice here so the plan is to extend the track all the way around the property. I am very excited about the way in which the ponies will link every element of the land together. And by putting them in a track around the perimeter I will be able to improve the drainage by making ponds/ swales/wetlands in the middle of the paddocks. Beside myself with glee!! Carole that sounds wonderful. I do remember how excited I was when I first realised that I could keep ponies in this way. I have shown it to all my traditional horsey friends and they just do not get it. I can never understand that. I would love to see photos of yours when it is up and running. I thought I’d let u know that my track is working fabulously. I now have 4 ponies. 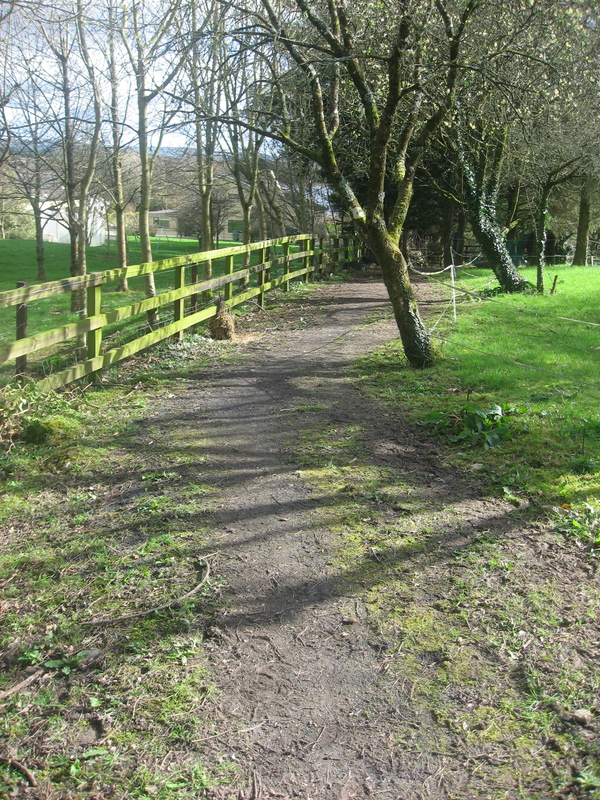 The track runs all the way around the boundary against the ditches. It’s 4 and half acres so the track is quite long. I don’t feed any hay, there is more than enough grass and if I think its getting a bit bare I just move the plastic posts a bit further towards the middle of the (3X1 acre) paddocks.I also close off sections from time to time to let it recover. I have a bell outside the back door which I ring when I want to give them a treat and they all come out from wherever they are hiding. They don’t bother with the stable, preferring the natural cover. I’ve left the paddocks completely ungrazed all summer so I’ll be interested to see if that helps with the drainage come winter. I have deserted this blog for a while so apologies for such a late reply to your comment. I am delighted to hear how well your track is working. I hope your winter has not been too muddy. I have been a new horse owner for 10 months. I have an adopted Shetland, 12-15 yr and a 14.3 hh Palomino 5yr. 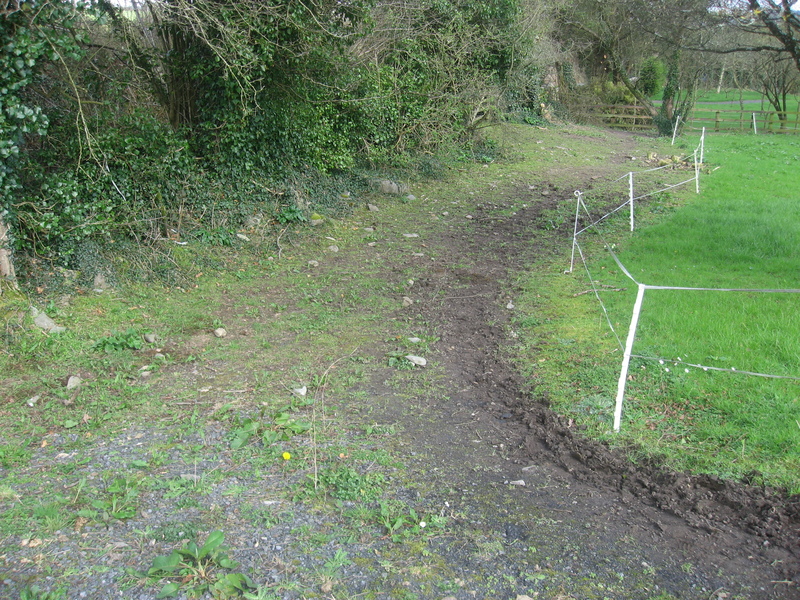 I have been researching into creating a track system as I need to get my horses off grass. Due to heavy rains, we have a grass explosion now, and I am getting very worried. One of my questions is do you have to use electrified fencing for the inside fence of the track. I already have a 3 rail perimeter fence around my 3 acres, which is separated into 2 paddocks, including a barn. My opinion would be that you do. Particularly if you have a Shetland:) In my experience ponies are very clever about getting to grass. I have two rows of electric tape, with the top tape being electrified. When we had small Kerry Bog Pony, Rosie, I had to try a few different levels for the bottom row, to get the gap between rows of tape and bottom row and the ground just right. 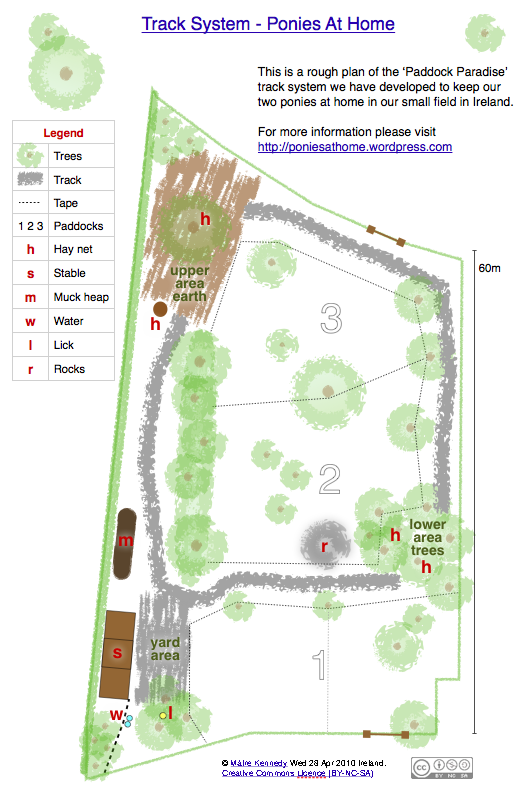 Hi, I have created a track system for my 2 barefoot horses in a small grass field ( about 1.5 acres ) which I have extended into the woods at the bottom of the field. It`s all done with electric tape, and has different surface areas created with pea shingle, sand, river rocks , logs etc. 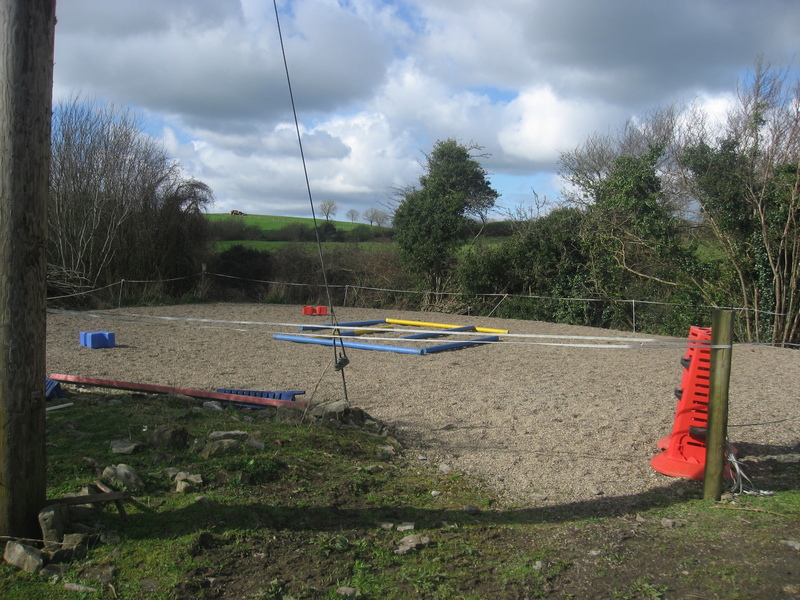 It`s the most exciting thing I have ever created, and I would encourage any horse owner with even a very small field to try the different surfaces and some sort of track. Lovely to read everyone`s experiences on this web site. Thank you ! P.S Jaime Jackson`s book is fantastic !